1. Purchase an above-ground kiddie pool in a dimension large enough to suit the user (e.g. child, adult, or both) and sport. At a bare minimum, the pool should be at least 15 feet in diameter and four feet deep for a child; however, for adults and additional safety—particularly if skateboards and bicycles will be used—aim for a depth of at least six feet. 2. Assemble the pool, and then line the bottom and interior sides with polyurethane mats. The mats are intended to provide an extra layer of protection between the foam and the ground and should be 1 1/2 to 2 feet thick. • Note: our polyurethane foam sheets are not intended for use in places where it will get wet. Please use indoors only, or plan to protect your foam pit from rain and water. 3. 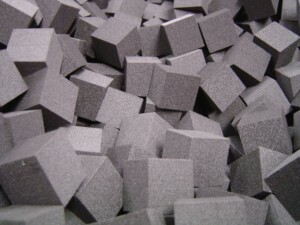 Loosely pack the pool with foam blocks or foam scraps, bearing in mind that the pieces must be large enough to protect against impact, yet small enough to allow for mobility. For best results, most experts recommend foam blocks measuring 6” x 6” x 6” or 8” x 8” x 8”. You can order blocks precut to your specifications or order larger blocks and cut the pieces yourself. 4. Test your foam pit with a few half-speed jumps from a low height to ensure that the level of cushioning and mobility are adequate. Gradually increase the speed and height of your jumps, making adjustments to the foam as necessary until the pit is capable of accommodating full practice sessions. If you’re looking to improve your skills in gymnastics, skateboarding, snowboarding, BMX, or other extreme sports, then you should consider building a DIY foam pit for your home or yard. Follow the instructions here to get one up and ready for action in no time! Disclaimer: Please use our foam materials responsibly. Foam Factory, Inc. is not responsible for any damage, injury, or death that may occur during use of our products. I’m wanting to see how much 8”x8”x8” squares cost? I’m interested in building a foam pit, and would like an idea on cost of foam? Thanks in advance.